The EDRY Custom Polo shirt with a stylish contrasting collar. Solid body with variegated texture. Contrast tipping on collar. Hemmed sleeves. Two-button placket and Easy care. 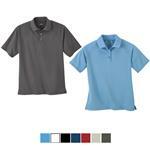 53% combed cotton/47% polyester, 5.6oz./yd2/190gsm with Edry™ wicking function. A great feeling blend of fabric and function. Price includes 7,000 stitches of embroidery. Pricing for sizes XS-XL. Available Colors: Fairway Green, Bahama Yellow, Hibiscus, White with Black, Black, Sand Dune, Crimson Red, Lake Blue and Classic Navy. All colors have white trim except White shirts have black trim. Production Times Available: 7 working days. Rush Available. Dimensions: S-5X for Men's and XS - 3X for Ladies. Price includes to size XL. Typical Imprint Area(s): Front, back, sleeve. Available Imprint Options: Embroidery or Heat Transfer. 3D Embroidery, Bar Codes, Gift Wrapping and more. 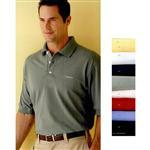 53% combed cotton/47% polyester, 5.6oz./yd2/190gsm with Edry™ wicking function. UV Protection. Easy Care. Contrasting Polo Shirt.